What was your best wood shop improvement? Just curious. Looking for ideas. A bunch of lights. Or a workbench. It’s a tossup. 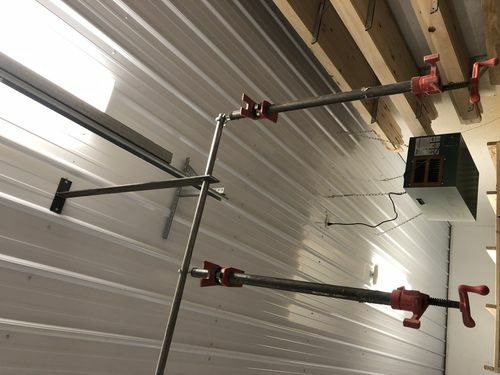 my assembly bench with outlets for electric,air lines,vertical clamp rack,t-tracks on the top for holding things down,paper roll holder and enough storage space for everything needed for project assembly,on wheels for mobility. The best thing I did was enlarge my driveway so I could keep my wife’s car and mine outside. Rolling workbenches and wheels under all of my tools. In 15 minutes I can have the entire shop out in the drive and humming. I get more equipment in place than the army did on Omaha beach. love me some band saw. My SawStop Job Site saw [ducks]. I’d like to get a larger band saw, but there wouldn’t be any room for it if I had it. I’m in a minor fraction of a two-car garage. 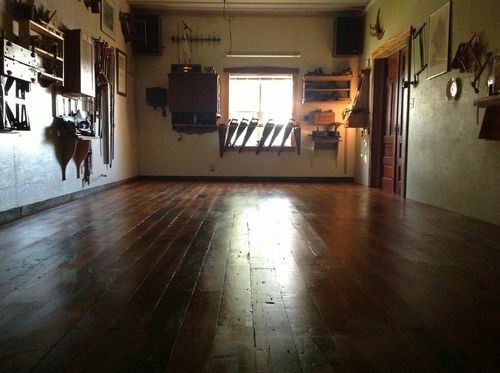 Smitty’s wood floor brought tears to my eyes.